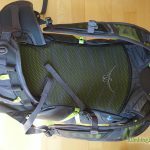 The Osprey Mutant 38 model has been around for a while now, but not too long ago, they tweaked the back pack so well, it won the Ispo Award in 2014. 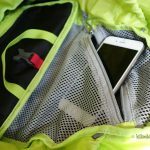 The pack is an all-year-rounder. 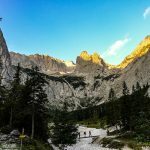 It’s gamed for climbing in summer, and ski-touring or ice climbing in winter. 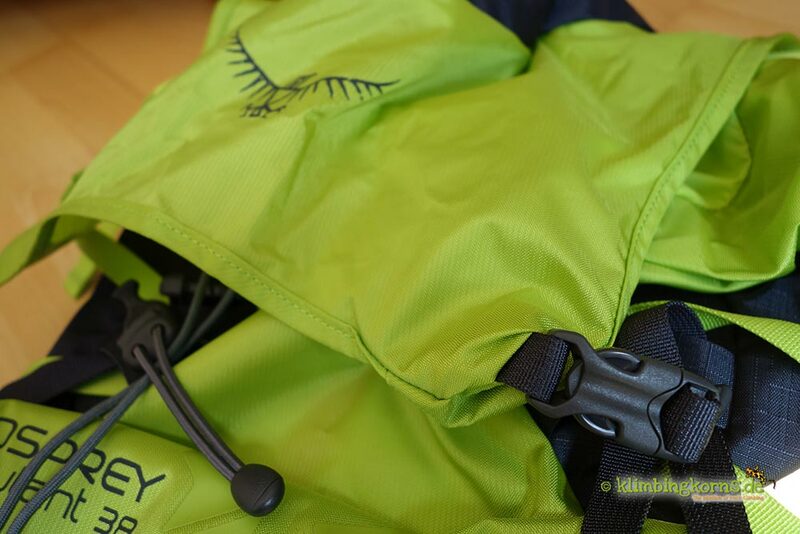 The pack arrived early spring at my doorstep, which gave me ample time to take this pack inside out to test. Looking back into history, there were a few changes done . 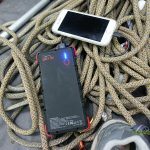 They stripped about 380 g of material making the pack really light, and removing some features you won’t necessarily need. 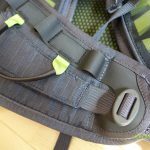 The EVA die-cut ventilated shoulder harness is almost transparent now, where you could actually almost see through the foam they are using to form those straps. It’s still form stable, it allows plenty of air to ventilate. I didn’t feel that it was extremely thin, even when carrying a heavy load. 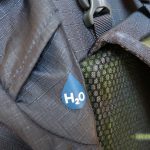 They removed the external side pockets, but it didn’t hurt that much as the pack was already hydration bladder system ready. If you’re using a water bottle e.g. one of those from Nalgene, you will have to be packing it inside. 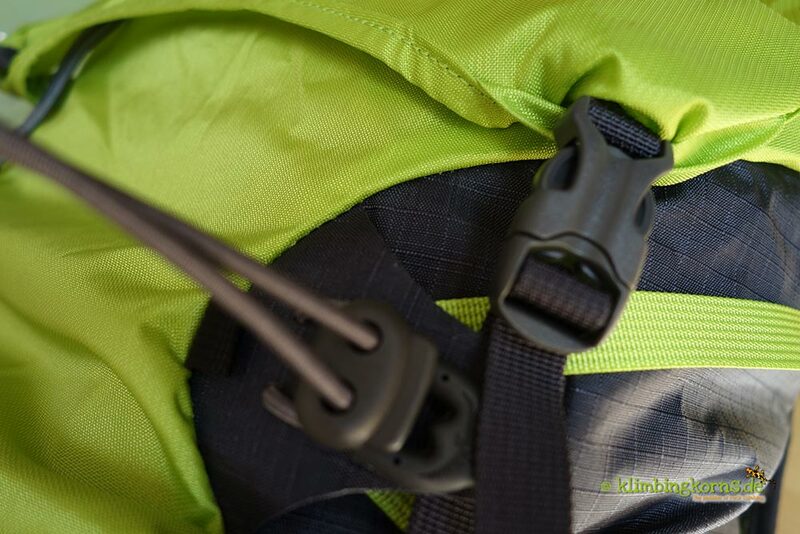 Those straps at the side are great for strapping in a ski or trekking poles. 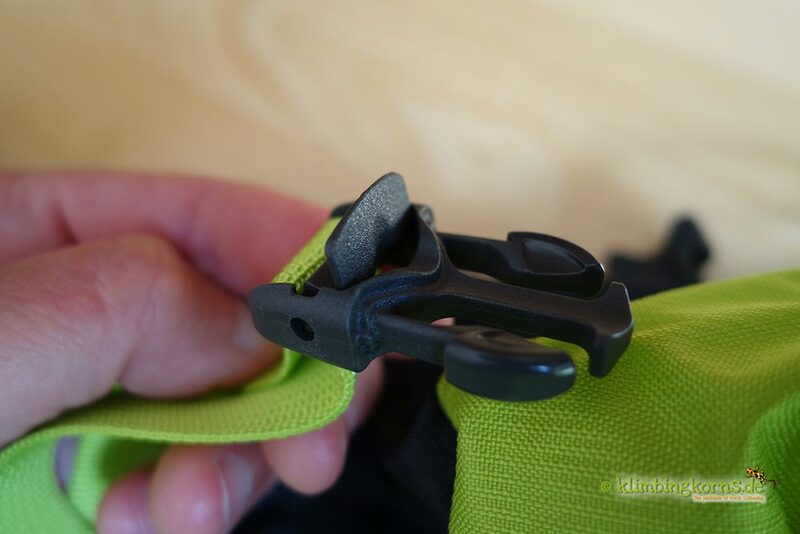 Ice climbing axes now has place in front with the Dual ToolLock™ feature making sure the attachment is secure. 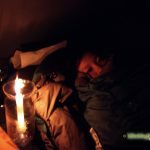 Use the pack light or to its fullest. 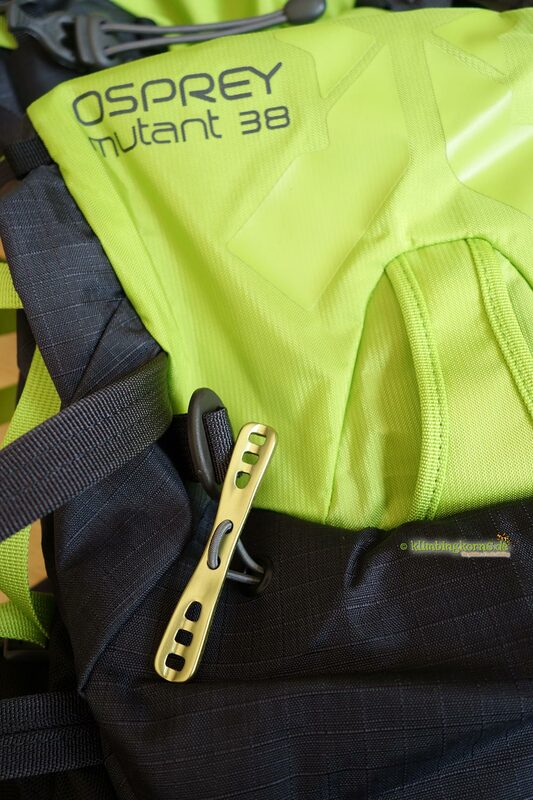 The pack came in black and green, which I absolutely fell in love with. 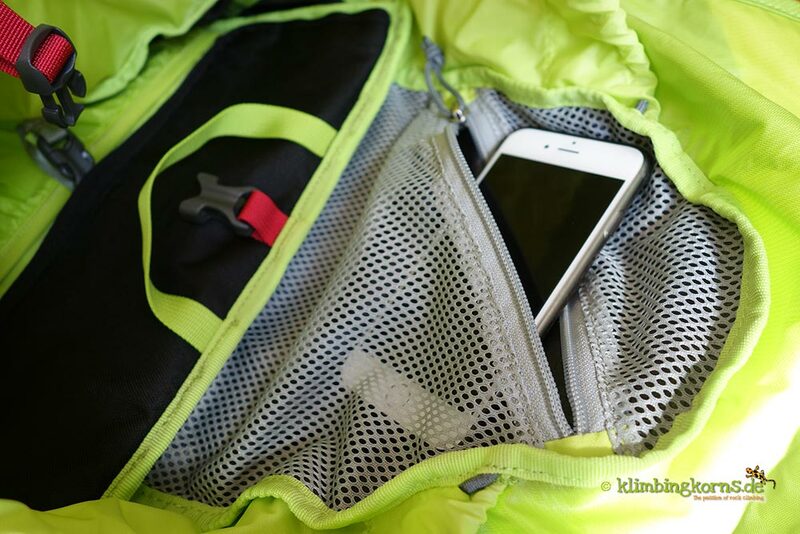 The pack is a toploader, equipped with a removable lid. 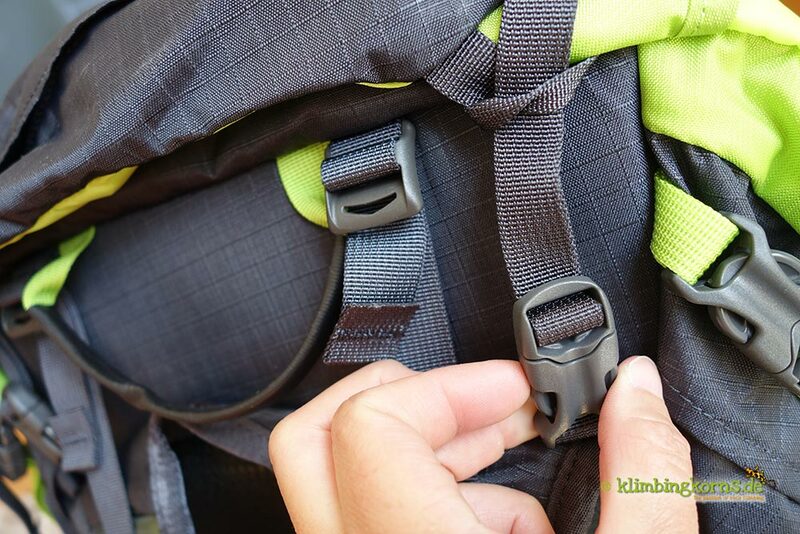 This makes the pack even lighter whenever you please. The pack weighs less than 1000 g, when you remove the lid. 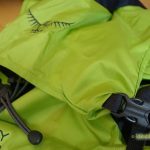 It acts also perfect as a bag and is easy to remove, when you want to take your valuables with you, while you leave the rest of your pack in the lodge. 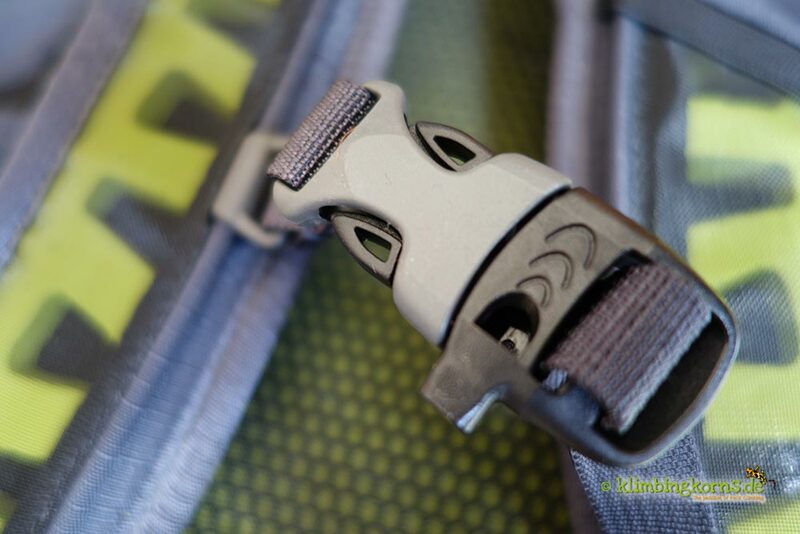 The side straps can compress the rest of the pack, making it really small. 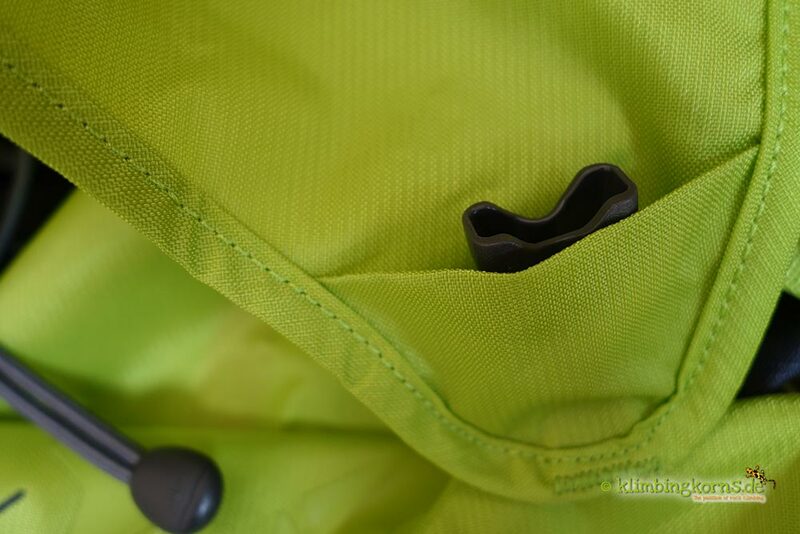 The lid has 2 external pockets. It’s big enough to hold a 3cm thick climbing guidebook. 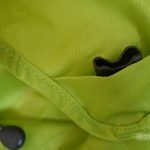 The other pocket keeps the mesh for climbing /ski helmets. 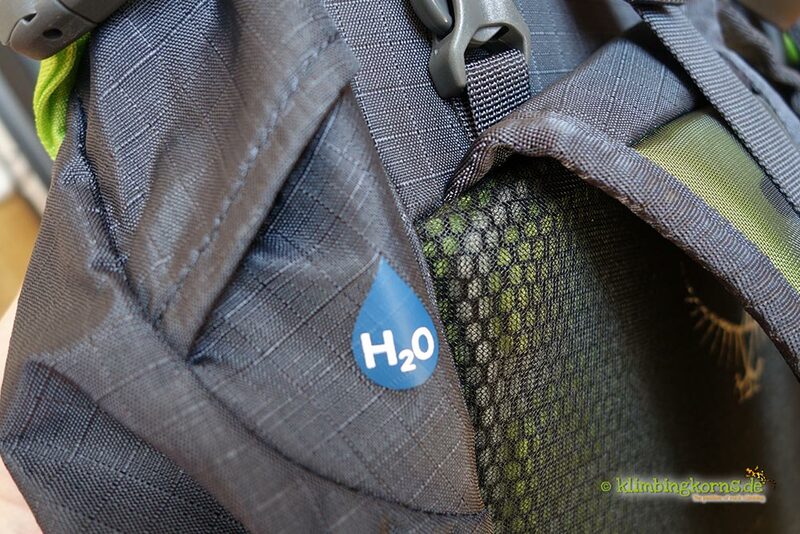 Inside the pack, a pocket for a hydration bladder separates the bladder from your equipment. Two exits for the hydration tube is available on each sides. 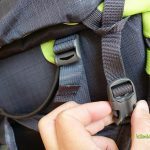 An extra thin internal lid can be used to separate the contents when you want to strap the climbing rope under main lid. The back of the pack is not too stiff nor too soft. It gives a good halt and cushion to heavy weight contents. 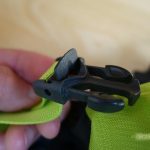 Hip belts comes with a few loops for hanging extra carabiners and gear. 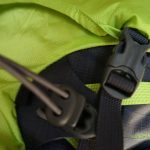 I would have prefered to have those loops on my harness instead, and so, I can go without having these loops and save on more weight. These Hip belts, they can do more! When you have a harness on, you can just bend the hip belts behind and button it in. 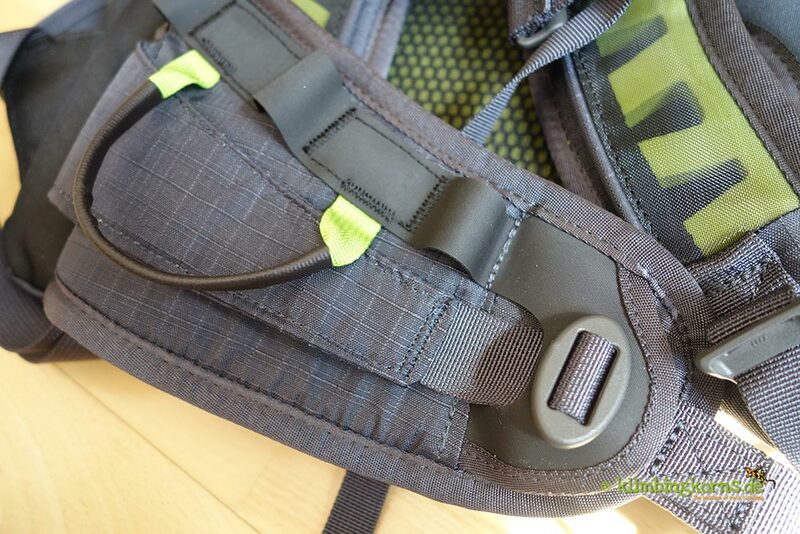 Use then the strap belt instead to hold the pack together. 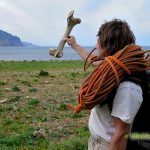 21 quickdraws, 70m rope, shoes, chalk bag and harness were some of the things it had to carry. 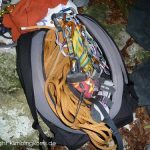 Taking extra jackets, water and equipment will have to see the rope outside, hanging over the lid. There were days when changeable weather makes it indecisive of what to wear and bring. So, bring all! 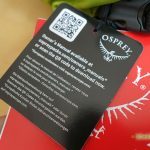 With the help of Osprey’s Pack Sizer™ App, you can determine the right size of the pack for you. You only need to make a picture of yourself, starting from the hips up to the shoulders, and voila, the App will tell you which size is right. 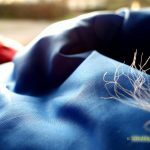 A neat innovation that made it to the Ispo Award 2015/16. Strapping a helmet in a rather empty pack makes the pack wobbly, and I still preferred placing the helmet behind (like those for the MTBs) Strapping the helmet on the top makes it also restrictive to look up , with the lid and helmet getting in on the way. 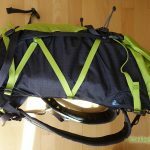 38 litres is just nice for your equipment, but 40 litres would be better to hold the climbing essentials, jackets, food and drink. 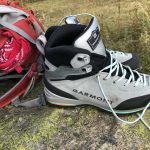 You’re probably apt to take in more during sports climbing than when you’re doing alpine, but then again there’s the 28 litre version to be happy with. It’s one of the most comfortable back packs I have had by far. 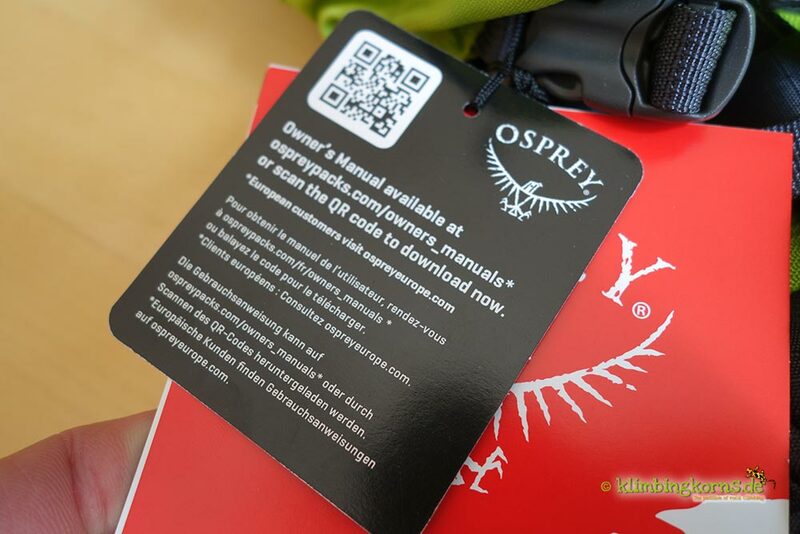 It sits well on my hips, it’s slim enough to be used while you’re climbing, or doing a Via-Ferrata. 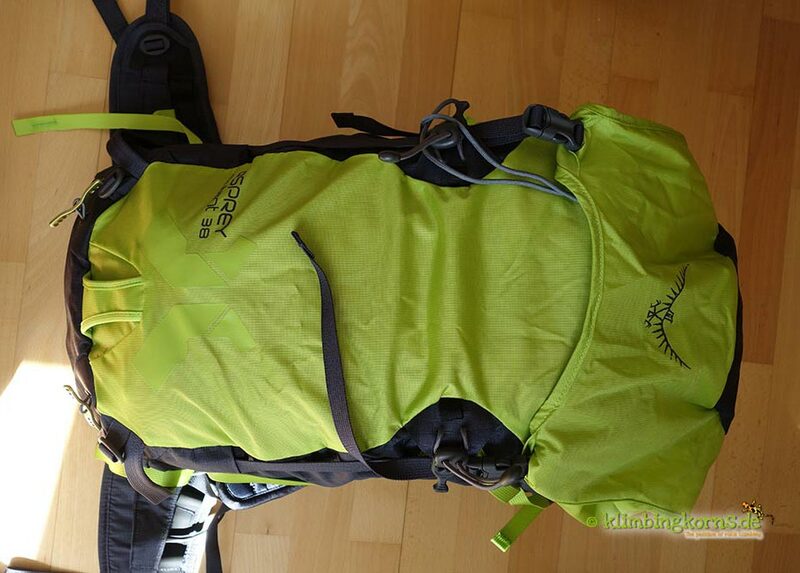 It’s also light enough to use for a short running spree in the trials or as a weekend pack for the mountain lodge. 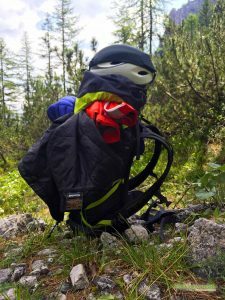 I didn’t have this pack long enough to test it in winter, but so far, the pack’s doing well. 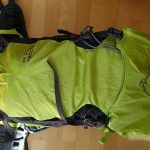 Initially, I chose the Kestrel 38 to be my climbing pack. 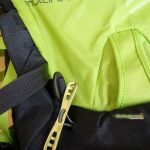 Ever since having the Mutant, I must say this is the perfect pack to go climbing. I have been using it since. 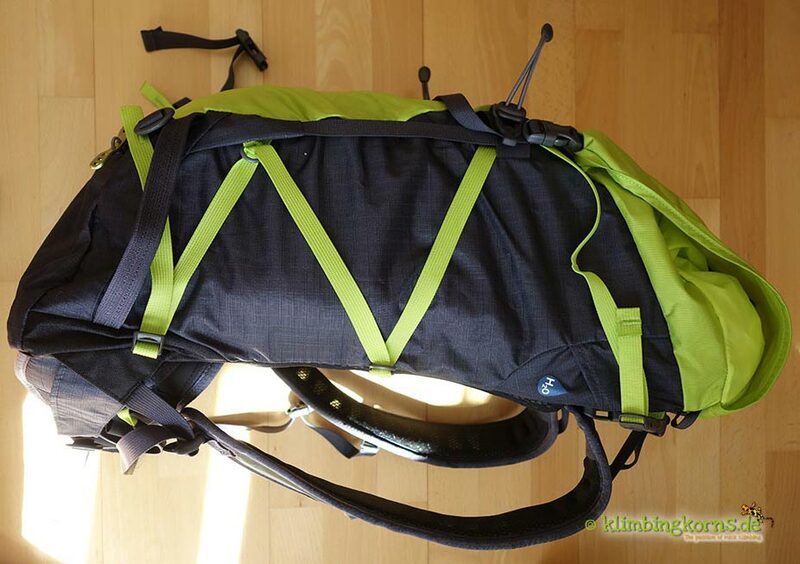 Another Top-Loader I reviewed is the Cinderpack 40. This comes completely without a lid. The Mutant is available in 2 sizes: 28 litre and 38 litre, in S/M or M/L. 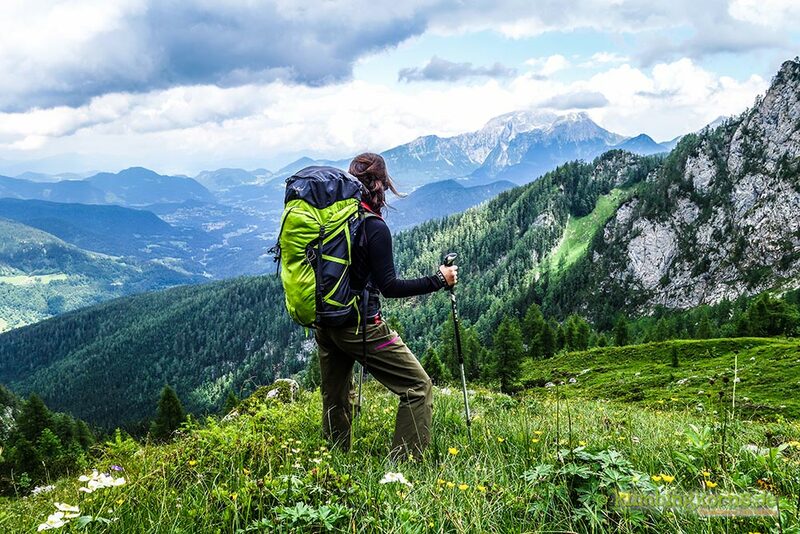 Use their Pack Sizer App to find the right size for you. 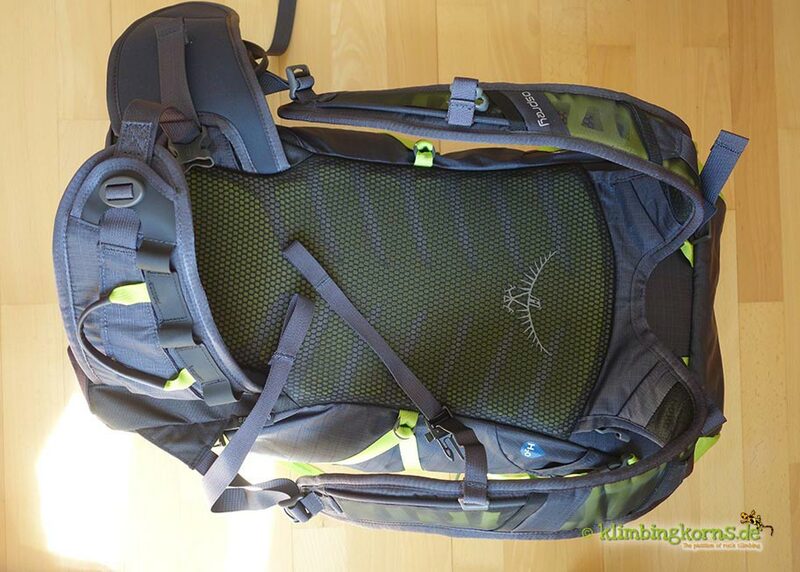 The Mutant 38 litre costs 120 € Listprice and varies depending on offers in the net. 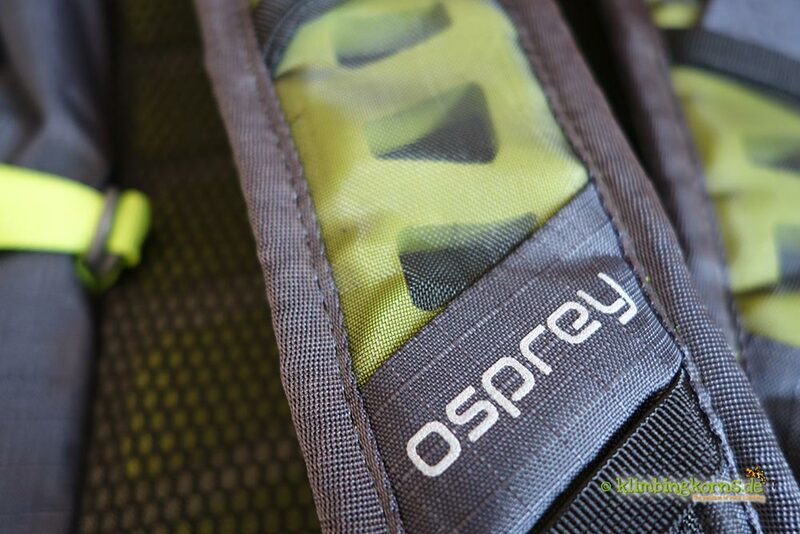 Osprey, sits in California, produces nothing else but bags and packs since 1974. 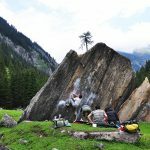 I was a little surprised to find how well they excelled in making packs for the target group climbers, and are walking big steps in the right direction. 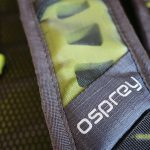 Osprey, you guys did a good job! Thank you for giving me an insight! 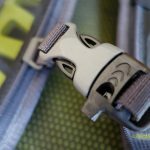 Fixed secure whatever you’re strapping without budging a mm more.